Pronounce it any way you like, this state has it going on. Consider the incredible influence Louisiana has had on so many of our music traditions - blues, swamp blues, jazz, zydeco, cajun, second line brass bands - the list goes on and is deep. With Johnny Sansone coming next week, Joe took last night to survey his discography a little, playing samples from some of his early work that definitely roots him blues with strong influences from zydeco, soul, and rock. He's definitely soaked up his place! 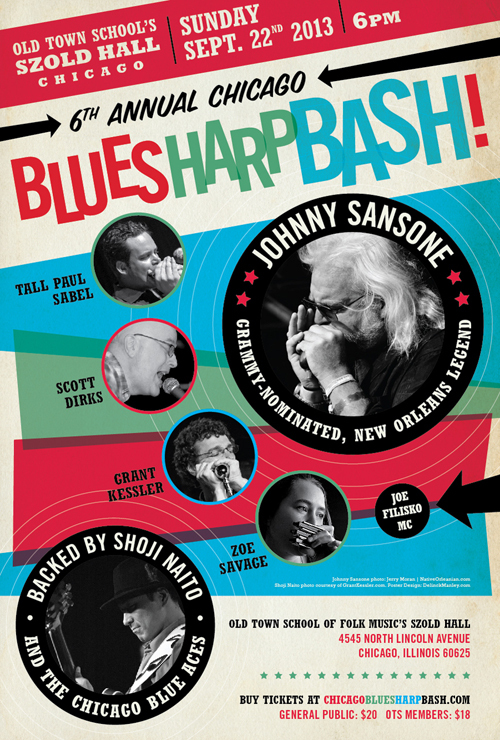 Remember that if you're in Chicagoland next Monday, September 23, you gotta come to B1 and soak up some Johnny Sansone! He'll be playing and talking and answering questions on the big red carpet, so get yourself there! Screamin' Hot Harp Week In Chicago!!! Get off the couch, caffeinate yourself and go see some shows this week! Jim Liban's in town and playing with the incomparable Joel Paterson Trio, our last Bash headliner Sugar Ray Norcia's at Legends, Johnny Sansone's headlining our Bash and lots of other great players on the calendar.